Last summer, I spent a few weeks in Bali and was so thrilled at the opportunity to live near the beach (in Seminyak). But it wasn’t as smooth as I expected. On my first beach run, my feet started to ache after about 15 minutes in, so I had to turn around to run back, making it a four-mile effort. After running four miles barefoot on the sand, I discovered that I have chafed and blistered my feet as if like I scrubbed my soles with sandpaper. Once my workout was over I had at least three painful blisters on my toes. It was horrible. The run almost ruined my vacation, but it was a valuable learning experience. Just because I was a runner didn’t mean that taking my workouts to the beach gonna be easy. Don’t get me wrong. I’m not trying to dissuade you against running on the beach—but you should know what you are getting yourself into before you brave the sands. In other words, beach running is no easy walk in the park. There are several pitfalls worth avoiding if you’re serious about making the most out of your beach workouts. That’s where today’s post can come in handy. In today’s post, I’m going to show exactly what you need to do to run on the beach and get the most from the session. Choosing the right beach is the first step. After all, not all beaches are created equal. Some have more slanted surfaces than others. Some are full of broken seashells, rocks, and garbage that can be painful to run on. As a result, whether you choose to tackle the foreshore or backshore, opt for the section of beach that provides the right conditions for you. Lots of beginners make the mistake of running on the soft sand. They think that it’s going to be gentler on the muscles and bones. But it’s not the case. Soft sand has lots of “give,” which makes running on it hard and may cause foot and ankles injuries, especially if you aren’t used to running in it. To stay safe, go for the firmer sand. This offers as much as cushioning as the softer sand, but you can also run on it for longer without risking pain. The best place to run on wet sand is just at the water’s edge. After a few runs, feel free to progress to the softer sand as your lower body gets stronger. Beach running exposes you to direct sunlight, which can put you at a higher risk of sunburns and other skin trouble. Not to mention that According to research, runners are more prone to skin cancer and other skin issues because of excessive sun exposure. To reduce the risks, lube up with a broad-spectrum sunscreen over any exposed area. If you’re prone to sunburns, use SPF 50 or higher, and slather it on. Another helpful measure is to avoid running during peak hours—usually between 10 a.m. and 4 p.m. when the sun’s intensity is at its greatest. Instead run early in the morning or later in the evening if possible. To stay safe, wear a lightweight, long-sleeved shirt. You should also consider putting a hat (or a visor) and sunglasses to protect your face from the rays. This is especially the case if you’re prone to sunburns. For the full guide on preventing sunburns while running, check my post here. 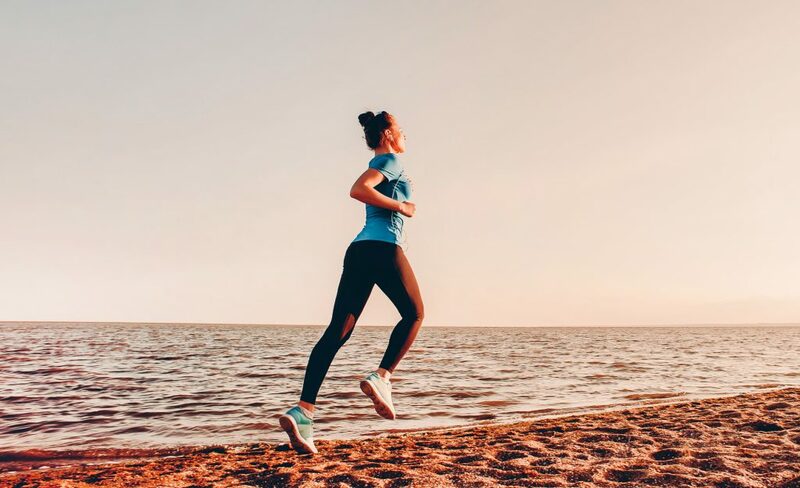 According to research, beach running forces you to consume more than energy than running on the hard surface, shedding as many as 1.6 more calories per mile. Since beach running is way more challenging, you’ll need to slow down until you build up your strength and endurance. Do not expect to run at your usual pace. For your first few beach runs, start on the hard, wet sand near the water. As previously stated, it’s much easier to run on the wet stuff than on the soft, dry sand. Shoot for no more than 15 to 20 minutes to make sure you don’t run too much too soon. Next, slowly add 5-minute increments as your body gets used to the sand. Once you’re confident, you can slowly add two to three minutes intervals on the drier and softer sand, then switch to jogging or walking on the firm, wet sand until you recover. As a beginner, do not do all your runs at the beach—even if you live near the ocean. Too much beach running early on may lead to Achilles tendon and ankle issues. The big mistake I made on my first beach run is going barefoot before my feet were ready for the sand. And as I have already mentioned, I paid dearly for it. 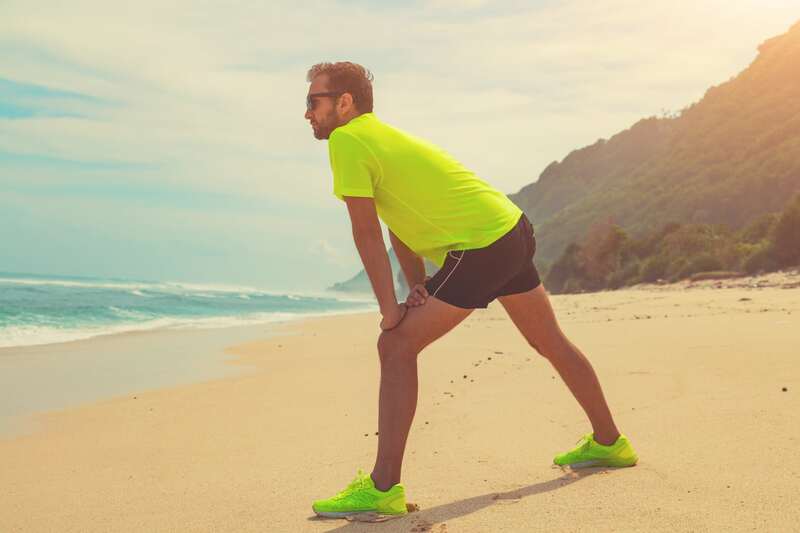 So, if you haven’t been regularly running barefoot before your beach adventure, running, even for a few minutes, will place a huge amount of stress and strain on your plantar fascia, Achilles, and calves—which can result in soreness, pain, and blisters. And you don’t want any of that. Of course, running through the sand feels amazing, not to mention the pristine scenery that comes with. But here’s the little caveat. Unless your feet are calloused enough, moving through the sand for a lengthy period is going to irritate your skin. Not only that, but barefoot beach running can also result in or worsen Achilles issues, plantar fasciitis, or ankle sprains because of the lack of proper support from running shoes. That’s why I typically urge beginners to tackle the beach with their shoes on—at least the beginning. Wearing shoes provides support as well as protection from sharp objects hidden in the sand, such as rocks, sharp seashells, broken glass, and other human-made rubble. 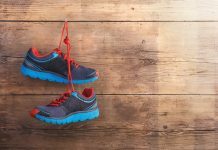 As a rule, go for lightweight, flexible-soled trainers, so you’re still getting the most out of the unstable surface underneath. You can also consider choosing shoes that have a tight mesh over open mesh—especially if you’re planning on doing lots of beaches running. If you decide to go shoeless, then be careful. If you’re a regular, shoe-sporting, runner then you’re just asking for trouble. You’ve been warned. Drink roughly one ounce of water per every 10 pounds of weight in the three to four hours before your run. Just remember to give yourself enough time to use the restroom before you head out. For longer beach runs—anything lasting for more than 30 minutes—you’ll need to carry water or plan your course along water stops. Ensure that you’re well hydrated by performing the sweat test. Weigh yourself before and after your beach runs. This is the most effective way to measure your fluid losses and needs. Here’s the full guide to proper hydration while running. Here you have it. The above training guidelines are you all you need to get started running on the beach safely and enjoyably. Now the rest is up to you.